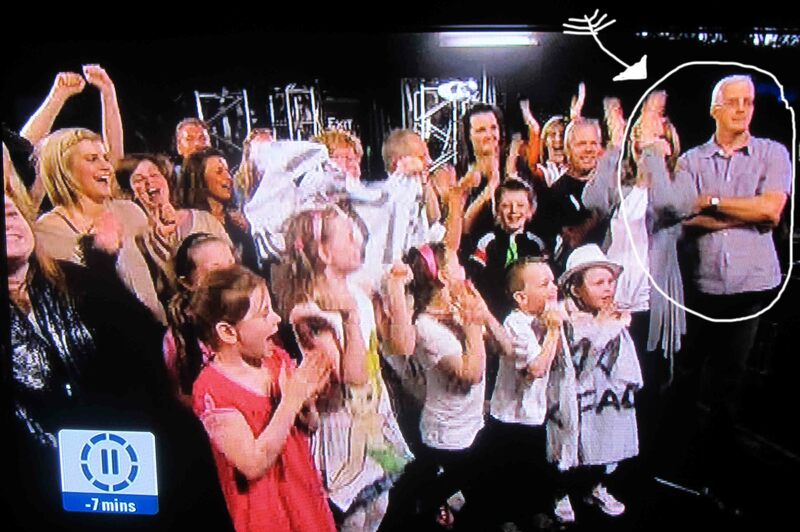 This is the precise second my mate Shaun discovered that his daughter Maria had got 4 Yes’s on X factor. He is out of control. Wildly emotional. Orgiastic in his delirium. Good old Shaun. Like an Octopus on a trampoline having 240 volts passed through it! Well, it’s not every day you see a legend in the flesh. When I say a legend, I don’t mean of Clooneyesque proportions. 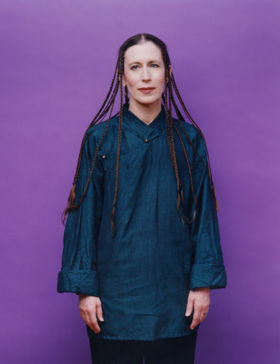 I think we’re more in Daliesque territory because Meredith Monk (who records for ECM which might give you a clue) is not what you’d call mainstream. Approaching 70, she led the line in her own production with grace and conviction. Her and co writer, Ann Hamilton’s Songs of Ascension (which was commissioned by the wildly applauded Kronos Quartet) is never, ever going to trouble any sort of populist chart any day soon. And the mass exodus from The theatre after about 15 minutes when it reached the height of “obscurity” was quite tell tale and amusing. In the foyer beforehand I was told it was, to paraphrase, “pish”. But it wasn’t. It’s a devastatingly original smorgasbord of jungle noises, American Indian type language and a range of string and wind instrumentation that goes from dischordant noise to utter beauty in less than a minute. There’s quite a lot of creepy hippy dancing and some blurry meaningful monochrome video in abundance too. But. It works. I loved it. Although I guess I’d be a little challenged to explain the plot – other than it’s about nature, getting back to one’s roots and rebirth. Maybe. Even Jeana loved it. Mostly (sort of). The choir (I assume put together locally) stole the show in the finale number and we all left happily. Try this. You’ll no doubt hate it. I had the not inconsiderable pleasure of spending Thursday evening meeting, introducing and then listening to Dave Trott present at Robbie Smith’s studio in Leith in my role as Head of Client Services at STV. Thereafter we had a beer or three in the Cafe Royal. 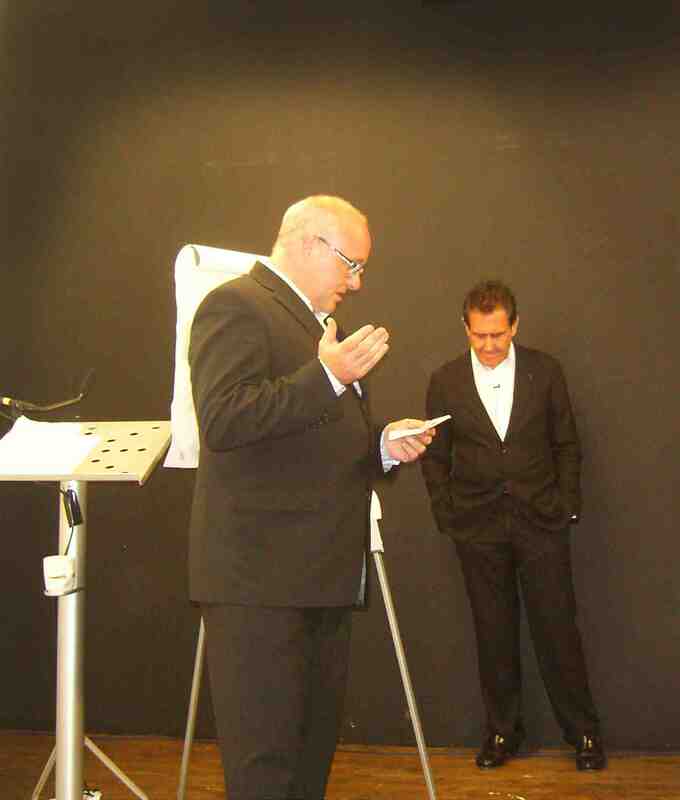 Since then I have been inundated with messages of thanks proclaiming him the best speaker people have ever heard. Because although ostensibly this was a talk to creatives about creativity it was, in actual fact, a potted guide to strategy development (which is, of course, at the heart of all creativity). In his speech he poo pooed the notion that creativity starts with impact. Because vacuous impact creates no effect other than fueling the egos of lesser art directors. No; creativity starts with persuasion, by identifying what he often referred to as the, usually disregarded these days, USP, then working through communication (ie the content of the message) before gilding the idea with impact. Created in this order ads of any kind (and any medium – digital or otherwise) have the ability to “go viral”. It was all done with a deep and committed single mindedness and lightness of touch that was jaw dropping in its simplicity, but eye opening in its possibility. Dave Trott. You are a genius Just like Cloughie! And then to top it all off Doug Cook sent me this astounding picture. Me and Trotty. David and Goliath. This London based theatre company (with a strong Scottish core) brings a 5 header cast and 5 strong orchestra to Edinburgh to perform a fast paced review of Sondheim’s finest. (Although only one Sweeney song makes the cut. Boo hoo.) It deftly demonstrates just how brilliant Sondheim is lyrically and musically although with a relatively small cast it’s the lyrics that take centre stage, despite outstanding moments of musical magic. It would need a larger ensemble to bring out the more complex choral harmonies that shows like Into the Woods and Sweeney have. That said, we have a multitude of brilliant songs to pick from, and carefully segued they are with a storyline that sews them all together. Certainly alcohol, in the form of a lounge life culture that permeates Manhattan, features strongly as does love, relationships, doubt, despair and commitment. The stand out performance, for me, was “Not getting married” from Company that took the breath away with the vocal gymnastics required to deliver it by Gayle Telfer-Stevens. The show also benefited enormously from the delightful lugubriousness of Adam Woodhouse throughout. All the cast can sing. Really sing! And the orchestra, led by FCT past MD, Neil Somerville, is subtle, controlled and seemingly note perfect throughout. All in all, a lovely late nite show and, for Sondheim enthusiasts, a festival must see. And, dear reader, a Brucie bonus! Here is Sondheim masterclassing Not Getting Married. A wee peachy moment. The show was stolen by Zimbabwean Jock Gamu Nhengu who was absolutely brilliant and carries a heart rending back story too which, of course, is what it’s all about because, let’s face it, they can all sing including our pal Maria Doherty who got through to Boot Camp last night but was only shown for about 1.1 seconds. G and S (Gay and Straight) were the night’s comedy high point if you don’t count the aforementioned Katie in which a reasonably competent straight girl is given a second chance after dueting with a mincing twit of Pythonesque proportions who took the gay cause back to the days before John Inman – what a joke. Loomi Rapace. The Girl with the drago tattoo. In true Bergmanesque fashion this languid Swedish gem of a movie starts slowly and gradually speeds up to walking pace. But let that not put you off. It’s an understated little gem of a thriller that gradually unfolds with a complex and multilayered story that is packed full of repressed sexual abuse messages. At its core a political activist and writer (Michael Niqvist playing Michael Blomqvist) is hired by an industrialist to solve the 40 year old mystery around the disappearance of a slightly loopy teenage girl. Running simultaneously is the back story of a young super hacker (Lisbeth played by Noomi Rapace). Although a lesbian she gradually falls for, 30 years her senior, Blomqvist. Everything about this movie is subtle, even the fact that at no point in the movie is there any reference to its title, other than in one beautifully shot scene and even then it’s almost incidental. The chemistry between Lisbeth and Blomqvist is so delicate you think it will shatter at any second, instead it grows millimetre by millimetre into a great double act. For that one has to applaud director Neils Adren Oplev whose work is unfamiliar to me. It centres around abuse of all kinds, fundamentally sexual, but also racial and religious all wrapped together in a neat package that carries a strong moral and emotional punch and the good news is that the other two books in this series have also been filmed by the same team and are due for release BEFORE Hollywood enters the fray. It’s out on DVD now but please choose to watch it the way it was intended. In Swedish with subtitles, not the coward’s way out (overdubbed in English). Gibberish? The Whistle by Charles Murray. This is the tale of a herd-lad who ‘cuts a sappy sucker’ from a rowan tree to make a home-made whistle. Having a good ear, he quickly learns traditional tunes and delights the locals with his playing. But you should hae seen the whistle that the wee herd made ! 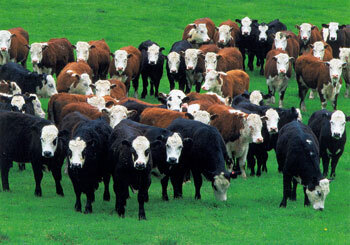 There was comfort in the whistle that the wee herd made. Was a marrow for the whistle that the wee herd made. He got ream an’ buttered bannocks for the lovin’ lilt he played. Wasna that a cheery whistle that the wee herd made ? Hae ye ever heard o’ whistle like the wee herd made ? For the maister brunt the whistle that the wee herd made !